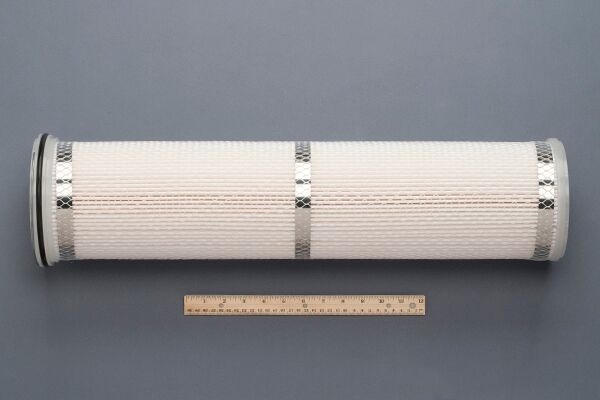 With a removal efficiency of 99%, these bags are available in filtration ranges from 1A to 40A microns. 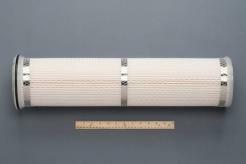 Due to the unique design of this pleated cartridge, it provides 35sq. ft. of filter surface area which will fit most Size #1 & #2 strainer baskets. 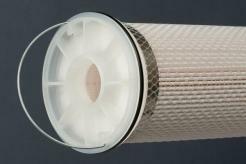 Dirt holding capacity and efficiency are maximized by pleating several different filter media together in a single pleat element. A single cartridge is designed to replace up to 20 standard nominal rated filter bags. The cartridge is designed to fit into existing baskets and provide an O-ring side-seal without any housing modifications. 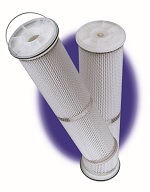 It is available in different filter media to meet chemical compatibility and industry standards. To achieve optimum performance while minimizing filtration costs, it is recommended that the flow rate is at 30 GPM and pressure at a maximum of 25 PSID. If you are not certain about your housing specifications, please contact us prior to making a purchase. Please choose Micron Rating, then the Material (Polyester or Polypropylene), and then choose the desired size/length and the end cap. Standard packaging is 4/case with a minimum order of 2 (which is a 1/2 box quantity).